Every once in a while nature puts on a free show and the world goes nuts for it. Yet another will come up August 21 when the moon will pass between the sun and the earth, presenting a total solar eclipse, visible this time in the United States. But not all of the U.S. Only an approximately 70 mile-wide area, stretching from Oregon to South Carolina, will get the full effects, with broad daylight turning to evening twilight in a matter of minutes. People who don't happen to live inside this narrow band can still experience the eclipse if they can get there, and Hotels.com reports lodging establishments located inside the eclipse path are booking reservations at a record rate. According to a report by the booking site, Nebraska, Kansas, Missouri, Idaho and Kentucky -- all of which lie in the eclipse zone -- have seen the biggest increase in hotel searches when compared year over year. Nebraska has actually seen the largest increase; searches are up 325%. Kansas is next at over 200%, followed by Missouri at nearly 160%, Idaho at 135%, and Kentucky with a 130% increase. 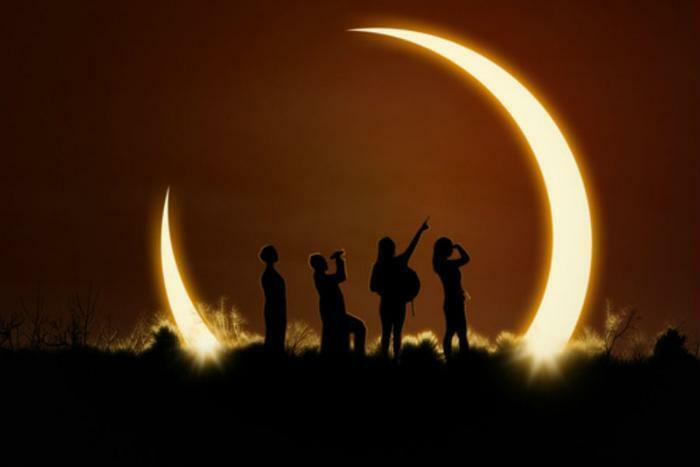 "Total solar eclipses are special events in the Universe," said Thomas Hettinger, Ph.D. and a member of the Hotels.com team. "In addition to requiring a moon at just the right distance with just the right size, a planet must also have a star at just the right distance with just the right size." Because these events are rare and because they are best seen in a limited area, regions not known as tourist destinations tend to be crowded with tourists, at least for one day. The experts at Hotels.com advise making reservations as soon as possible, especially since there are still some deals available. In Nebraska, Omaha's Magnolia Hotel earns 4.3 out of 5.0 stars on Hotels.com and rooms start at $169 a night. In Manhattan, Kan., the Anderson Bed & Breakfast is $141 a night with 4.9 out of 5.0 stars. In Meridian, Idaho, the My Place Hotel's rate is $198 and has a 4.6 star rating. Those who have seen a total eclipse call it a spectacular experience, but health officials caution that no one should look directly at the sun during an eclipse without special precautions. The only safe way to look directly at the uneclipsed or partially eclipsed sun is through special-purpose solar filters, such as “eclipse glasses.” The American Astronomical Society cautions that ordinary sunglasses or homemade filters aren't safe.